Whether you have long or short hair, fine or thick, coarse or soft, hair extensions are starting to come back in style. Depending how you get them done you can have extensions look so real that no one will ever know that it is not your hair. Extensions can be useful if you have to go to a fancy dinner, wedding or just want to go out on the town and do something nice to your hair such as an up do. Extensions are either synthetic hair or human hair strands that are attached to your real hair so you have the look and length you really want. Before you pick just any style, be aware that their are a few different types of hair extensions you can have done. 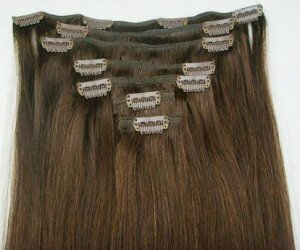 clip on extensions are not only the cheapest way of getting extensions done but also the easiest of them all. Clip on's won't harm your hair the least bit. Part your hair, starting at the nape of the neck and move to the top. All you have to do is either open up the clips or they may have a comb attached and clip them to the root of the hair or stick the comb right into the hair. This is a way to add highlights or make your hair fuller. Weaves are type is very small braids that are woven right in to your real braid. They will take strings and make a track that the weave is then braided to. Getting this type of extension done will possibly be more tender on your head because of the tight tiny braids and track that is set into the scalp. Showering and swimming are things to be done careful to avoid the possibility that they will fall out. Sealed hair extensions. For this type they seal the extensions to your head. The salon or hair dresser will put your hair in to sections. Then plant the extensions in to the hair. They do use different agents to bind it together. Of course they will be more expensive to get done, but they last for up to 4 months if you take good care of the extensions. You most likely can not do this on your own. Unless you have had some good practice. fusion is another method to weaving hair. You spray strands of hair with a glue that is a protein and it must be warmed before using. This is put right on to the natural hair. They will use a plastic template that will separate the sections of hair. When they have completed gluing the pieces of hair together it is then taken through a small hole that is in the template. Any of these methods that you have done need to be properly cared for. Unless you wish to spend more money to have them replaced. The finished product will have you looking like a whole different person. Try something new and different in your life, if you do not like it then it was a lesson learned. I would try the clip on first and see how you like it. Share a link to a page on Different Types Of Hair Extensions and we will consider it for placement on this page.